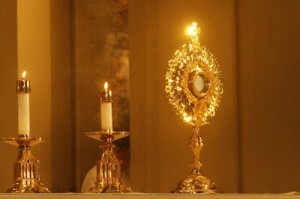 My parish in northern Virginia has [been engaged in] 55 hours of continuous Eucharistic Adoration and Prayer-including Benediction — “in anticipation of the General Election,” [starting] Sunday, November 4, ending today, Election Day, about the time the polls will close. Catholics never, never endorse any candidate from the pulpit as happens in some Protestant churches. Yet, over 2000 years, other more subtle and more efficacious modes of communication have been developed that respect the proprieties. Some bishops [have issued] letters and pronouncements instructing the faithful on a Christian’s duty to vote without mentioning whom to vote for or against. The fact that the Obama administration may be the single most anti-Catholic administration since the era of theKnow-Nothings is left unsaid but goes without saying. On religious liberty, life, and marriage the current crowd in the White House is committed, outright, to offending faithful Catholic Christians on every single important question of ethics and morality imaginable. Even Notre Dame, which awarded President Obama an honorary degree and now appreciates the maxim that no good deed goes unpunished, has sued him over the abuse of its religious liberties. This weekend, at home, we received a ton of mailers calling hellfire down upon President Obama and former Governor Kaine who is running against former Senator George Allen for our open Senate seat, a race just about as close as the presidential contest. Of course, we are also experiencing a barrage of TV and radio ads featuring women who are apparently living in tremendous fear of losing their access to birth control. Does anyone really take these claims seriously? We also received robo calls on Saturday from Senator McCain, Governor McDonnell, Pat Boone and several more from the Republican National Committee and the state GOP. The Boone call stung a bit since it was on behalf of some group targeting the over 60 crowd. How come we aren’t hearing from the young, the beautiful, and the hip for Romney? We live in a generally Democratic neighborhood in Fairfax County, but there seems to be parity in terms of Obama and Romney lawn signs, something we have not seen in an election since moving here eleven years ago. Twice volunteers for Romney have knocked on our doors enquiring of our support for their man. For some reason they keep missing the three yard signs my wife has planted on our lawn. God love ’em, we applaud their dedication and thoroughness in service to the cause. I am pleased to read that Michael Barone is calling the election for Governor Romney, and I enjoyed Karl Rove’s recent piece in theWall Street Journal making a great case for a solid win on Tuesday. Larry Kudlow, following Daniel Henninger in the WSJ, highlighted the expected surge in Evangelical voters in Ohio, Wisconsin, Iowa, and even Pennsylvania. News reports indicate that early and absentee voting by Democrats is falling behind 2008 levels which sound encouraging. But it is still a very close election. Moreover, whether or not our side wins on November 6, it has been a very unedifying campaign, one that has aggravated the already deep divide in America between Red and Blue, Republican and Democratic, Believers and Non-believers, Wealthy and Working Class. The Republican campaign was not bean bag; but the Obama campaign, starting in the summer, had to be one of the most mendacious of all time. Not only was it mendacious and dishonest, it was personal, nasty and vicious in its vilification of a successful, productive man whose professional and personal life were exceptional in all respects. Charles Krauthammer was exactly right when he said that the entire Obama and Democratic message seemed to come down to Big Bird and Sandra Fluke. Even more disturbing is that these totems of the Blue political model actually resonated with so many Americans who seem to have no tolerance for any restraint on governmental spending and interventionism, damn the consequences to the fiscal health of the nation or religious liberty. Just a few days ago I read a short news item indicating that the Centers for Disease Control (CDC) says we have reached a point at which 40 percent of all births in this country are out-of-wedlock or born to unmarried women. This is a long-term trend that Daniel Patrick Moynihan was crucified for highlighting forty years ago. It is now systemic, cutting across racial and geographic categories as experts such as Patrick Fagan, Brad Wilcox, and Charles Murray have noted in their writings. Aside from the personal tragedies — women without husbands, children without fathers or adequate love, support and economic and educational opportunities — this is a significant political milestone that points to a growing constituency dependent on government for more and more financial and material support without limit. This is not a population that may be temporarily taken aback by recession or hard economic times, but a permanent social block for which government, not their own labor and enterprise, will be the basis of their survival. Demography is destiny. It will also drive political choices over time. It already is driving them. I have no illusion that government can fundamentally change the behavior of so many people who have forsaken marriage, fidelity, and “bourgeois” morality. That is a social, cultural, and, yes, religious matter which must be addressed in those contexts. Yet, the first principle in life, and government, should be “Do no wrong.” So this is still the most momentous election in my life, maybe even more so than 1980, in terms of our one last chance to preserve a democratic republic that can still reconcile liberty and virtue. Don’t forget to vote [today]. G. Tracy Mehan, III, served in the administrations of both Presidents Bush at the US EPA. He is a consultant in Arlington, VA and is an adjunct professor at George Mason University School of Law.